We drove down the road to another viewing area and took a few more pictures. A little closer to the Sagamore bridge. A closer view of the bridge as a boat goes by. 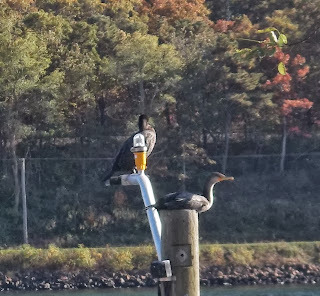 it was hard to see what these birds were from a distance. My husband first thought that one of them was a hawk. Through the camera we could see that they are ducks, the higher one has it's head tucked down, making it hard to see it well but it is a duck. 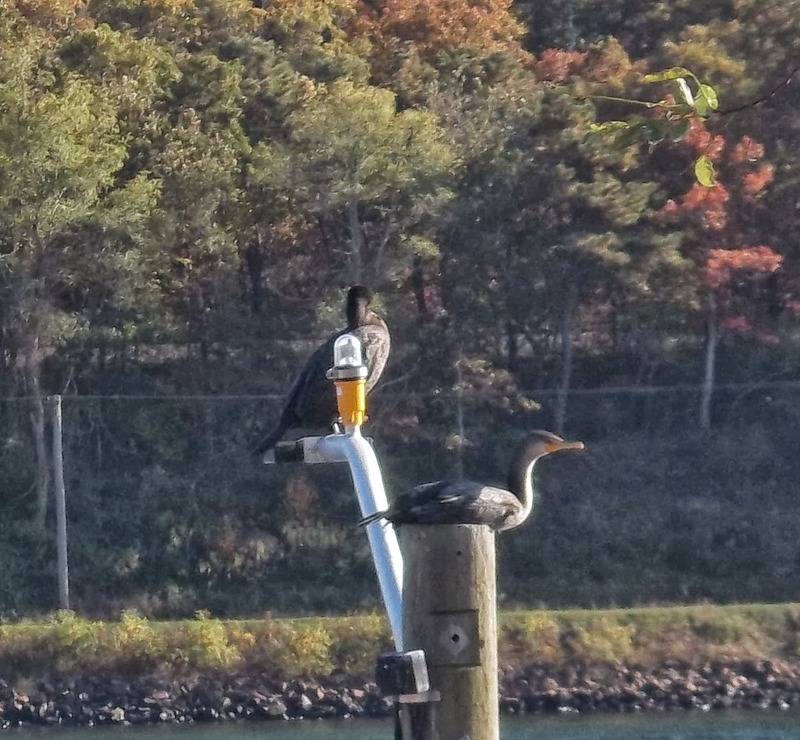 I've never seen ducks perched on a telephone pole like this, have you? 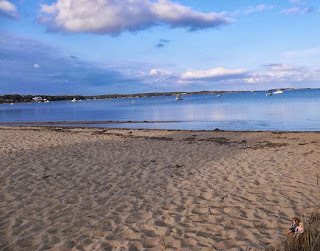 We drove a little further into the cape, then turned around at Orleans and took a slow leisurely route home. It was a very nice drive, we saw lots of pretty house, interesting landscape, quaint shops and lots of beautiful scenery. One of the fun parts of a drive through the cape is that you are never far from the ocean, as you drive along looking at the houses all of a sudden there is another beautiful view of the water. 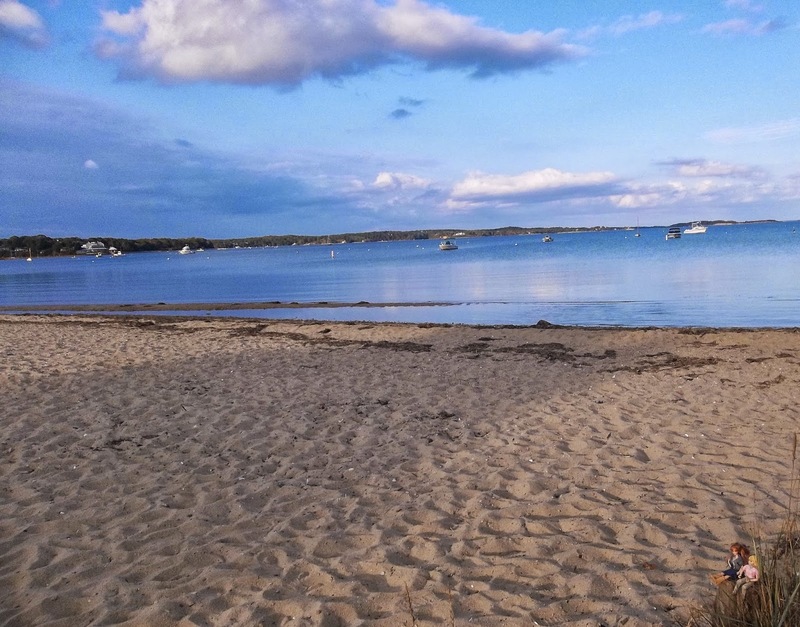 When we spotted this pretty little beach, in Harwich right before the Chatham line, we had to stop and take a few more pictures. Can you find the girls? Oops, our shadows are showing, the sun was behind us. The sand was very fine, we were very careful not to drop anything or anyone. "MJ keep your boots on"
MJ and Jaynie enjoyed seeing the boats anchored out in the water. Then saw the sign and found it even more interesting, so we turned around to take pictures. We were planning on stopping at our local Joann Fabrics on our way home but when I spotted this one we decided to stop in. It's part of the Christmas Tree (Shop) Promenade. I bought some purple fabric and a few supplies that I needed. We also drove by 3 or 4 mini golf courses that we found very interesting, there was a nautical/beachy one, a pirate themed one, a safari one and I think one more but I can't remember what it was. Jaynie has added mini golf to her long list of projects that she wants me to build for her. We need to think of a good theme. Any suggestions? I hope that you enjoyed the pictures, we had a wonderful day. I wish you all could have come along with us. More wonderful photos. The Jaynies' shoppe is cute. A good idea for a miniature facade. Your area looks so pretty! I find myself at the water a lot. I must have been a fish or something in a former life. Very pretty! It looks like the girls (and you two) are having a great time!! The two building are awsome! That is one fancy JoAnn's Fabrics. I would love to see the inside of that one! The display windows must be something to see. I am so glad to see you having such a great time with your visitor.